This is another dish which has so few ingredients, they must all be impeccable–particularly the ricotta. The fresher and creamier the ricotta, the more you will be seduced by this dish. It’s a wonderful appetizer, but it’s also so sweet and comforting, it can be a great dessert or palette cleanser on your way to dessert. The dressing on the spinach and grapes is olive oil, lemon juice and a touch of agave nectar. The light citrus and sweet agave make the entire salad taste like dessert–I think I could make a spinach eater out of anyone who tried this salad. The bruschetta must be great country bread, toasted with slightly burned edges and it must be hot. 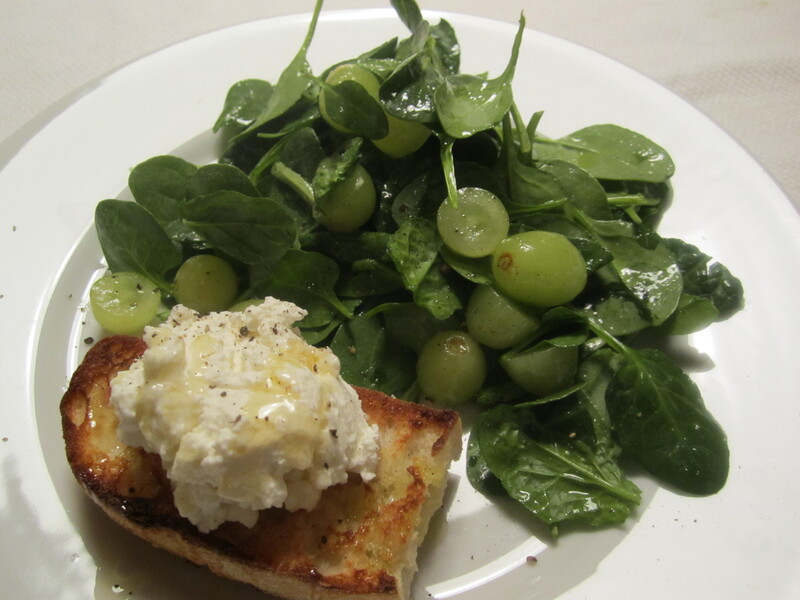 The bread gets a drizzle of extra-virgin olive oil, then the ricotta gets a drizzle of honey. I first tried this dish made with truffle honey, but the truth is, any honey will do just fine. If you want to substitute agave for honey, that’s fine as well, although honey’s assertive flavor goes well here. In a mixing bowl, combine sprinkle spinach and grapes and drizzle with lemon juice and agave. Add 2 tbls olive oil and salt to taste. Pile on plates. Toast bread and immediately drizzle remaining tablespoon olive oil over bread. Sprinkle with a touch of salt. Top with ricotta, then drizzle with honey. Top entire plate with some freshly ground pepper. Eat while bread is hot.